This page is where you can find resources related to my presentations about creating effective blogs and websites to complement instruction. How to create a Blogger blog. How to turn on comment moderation in Blogger. How to add or subtract contributors to your Blogger blog. 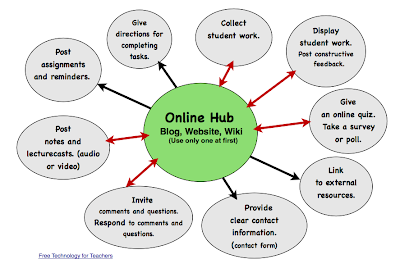 How to create an Edublogs blog. How to create a Wordpress.com blog. Creating a Google Sites website. See more Google Sites tutorials here, here, and here. Using Google Forms to give an online quiz. Tools for online quizzes, polls, and surveys. MyStudiyo, multimedia online quizzes - Example in action. ProProfs - Online Quizzes, Flashcards, and Polls. Obsurvey, Custom Online Surveys. - How-to Video. Skribit for Gathering Suggestions - How to. How to Edit the Size of Videos Embedded in Your Blog. Games you can embed into your blog. RSS Feed Widgets to embed into your blog.